Forget MI. YuDecide”, so announced Indian smartphone brand Micromax’s subsidiary Yu, when after a hiatus of about a year, it launched its new entry-level smartphone-the Yu Ace-on August 30 at a price-point of Rs 5,999. Yu Ace will be available in three colours — Charcoal Grey, Elektric Blue and Rose Gold. The last handset that the company had launched was Yu Yureka 2, back in September last year. The Indian smartphone market has been flooded with Chinese brands like Xiaomi, Huawei, Oppo, Vivo etc. and Micromax’s Yu plans to take on Xiaomi with four more launches coming up after its Yu Ace. Meanwhile, Yu Ace will be available as a Flipkart-exclusive device from 6th September, 2018. We checked the device out and here are our first impressions. A 2.5D glass serves as the display panel. The top of the front panel has got a 5MP camera with face unlock support and the earpiece. On the top-edge is housed a 3.5mm headphone jack. The right edge carries the volume buttons and the power buttons. The bottom edge has the micro-USB charging port. The rear panel houses a 13MP camera, an LED flash and a fingerprint sensor towards the top and the Yu logo and the speakers towards the bottom. The phone packs in a 4000mAh battery which is removable. It can be taken out by removing the back panel. SIM card slots and a microSD card slot are also housed at the back below the rear panel. It comes in a 5.45-inch HD+ display (1440×720 pixel resolution with 18:9 aspect ratio). The display brightness felt adequate and the display felt fine from different viewing angles. The colours are not punchy but the overall look of the icons on the screen is clear enough. The phone comes powered by a 1.5Ghz dual LTE quad-core MediaTek MT6739 processor. 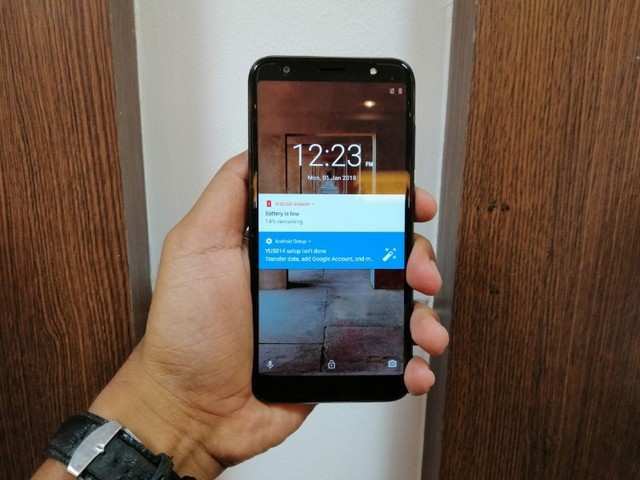 According to the company, it is the only smartphone at this price-tag to come with a dual LTE quad-core processor coupled with Android Oreo. Also, the phone is expected to get Android P in November this year. The 16GB storage is expandable up to 128GB via microSD. It houses a removable 4000mAh battery and has got these as the connectivity options: 4G VoLTE, Wi-Fi 802.11 b/g/n, Bluetooth v4.2, GPS/ A-GPS, micro-USB and a 3.5mm headphone jack. The phone, going by the specs, seems to be built for light users who want their phone battery to last more than a day. How it will fare with some serious long usage is still unknown to us. You’ll have to wait for our detailed review later. The large 4000mAh battery will soon be a plus for the phone but we thought that the RAM and the internal storage being provided by Yu, which is 2GB and 16GB respectively was insufficient if we look at the competition. Though there is another Yu Ace variant with 3GB RAM and 32GB ROM, why the company has brought out a lower variant than this was a mystery to us, especially after laying low for about a year and planning to take on Xiaomi. They could have brought out 3GB+32GB and 4GB+64GB variants. Yu believes that since many users prefer cloud storage these days, not equipping the phone with a large storage was the prudent thing to do. Also, the phone comes with a not-so-exceptional camera department. 5MP selfie camera is not at all to be expected if you are planning to take on the Chinese majors. Though the 13MP rear camera seems satisfactory at this price, it could have been a slightly upgraded one, like 16MP. We don’t know if the processor can handle multitasking. It seems like as if the company was more focussed on launching a low-cost product than on giving it something to boast of apart from the removable battery. We’ll let the consumers decide.